World Class Construction - Stained Glass Inc.
World Class Construction contacted Stained Glass Inc. to fabricate a stained glass window insert for a prayer room in North, Texas. As the main focal point for their prayer room, World Class Construction's client chose a stained glass rendition of Jesus, kneeling in prayer in the Garden of Gethsemane. Prayer is an extremely important part of Christianity. Prayer is vital in keeping a relationship with God strong and helps a person feel more connected and peaceful. Praying while surrounded by people, noise and other worldly things is very distracting. Having a private, separate space for prayer can be extremely rewarding. 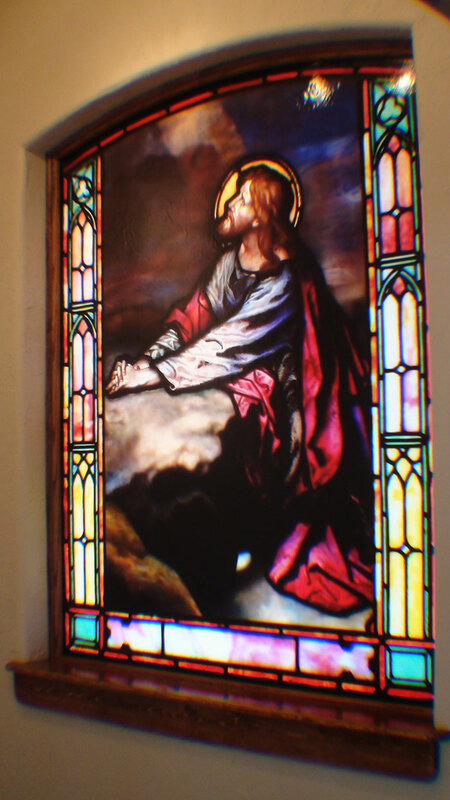 Stained glass adds a sense of peace and beautiful color to a room and the Gethsemane window design chosen for this prayer room is especially inspiring. As people pray they can gaze upon a beautiful illustration of Jesus in the same humble position. This modest image of The Savior is truly inspiring and serene. ...the window looks great. It will inspire thoughtful supplication for generations to come.